When looking for properties to Sell, Rent or buy, there are often many complications, we don't usually know where to look, nor the prices that are handled in the market. How are the payments?, What is the best area?. Infinity of doubts and insecurities come to us at the time of such an important investment. This is why the best way to carry out this important process is with professional advice, We must leave our investment in the hands of those who really know the area of real estate and that's Uptown Real Estate Group, we offer you personalized advice for your tastes and your budget. Uptown Is the best option you can choose when looking for properties in Houston, is an internationally recognized company with a team of professionals that speak Spanish and English, offering you advice on buying, selling and renting properties in Houston, Texas. If you want an apartment, a house or a lot in the best buildings and communities, Get the best places here. 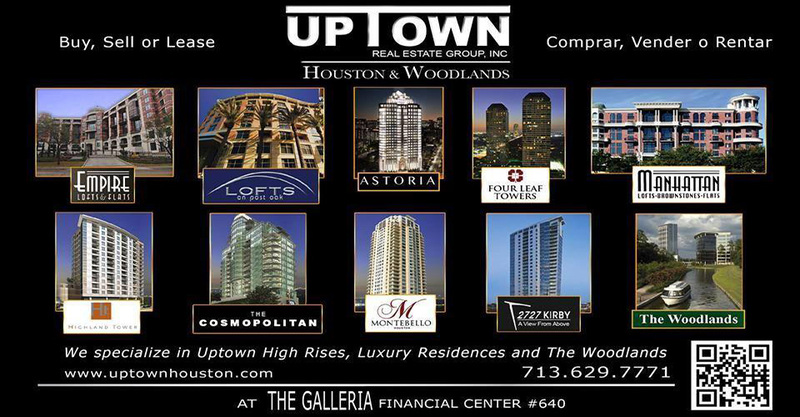 Uptown Real Estate Group is a company with more than 30 years of experience, has an extensive list of properties available in the city of Houston in the place In areas as Uptown, Galleria, Medical Center, Downtown y Memorial Or luxurious residences in areas as, Royal Oaks, Tanglewood, River Oaks, Cinco Ranch y The Woodlands. Uptown offers you absolute confidentiality and reliability on your investment, without any additional cost, and not only includes real estate services, if you need a bank, accounting, immigration and corporate counsel, the real estate company gives you everything you need with a group of specialists and certified professionals. If you are a foreigner and looking to reside in Houston or rent in the city, Uptown Real Estate Group offers advice and financing for foreigners, as for all services the financing is available from a 30% down payment. You already know all the benefits that Uptown Real Estate Group offers you. All these services in one place are the ideal combination for you to choose Uptown Real Estate Group as your company for buying, selling and renting properties in Houston, you can contact us through 713.629.7771 and call for free from MEX (55) 85.25.92.35, MTY (81) 41.62.33.14, GDL (33) 41.62.33.17 Do not wait more! Call to know the gratifying experience that this amazing company offers you.